The visitors, who only needed to avoid defeat at Blackfinch New Road to be crowned champions, resumed on 70-0 - needing another 202 for victory - and reached their trophy target when Morne Morkel pulled Dillon Pennington for four at 2.50pm. The victory was Surrey's ninth in a row in the Championship - a feat they last achieved in 1957 - and means they have now beaten each side in division one, but Worcestershire remain rooted to the foot of the table. 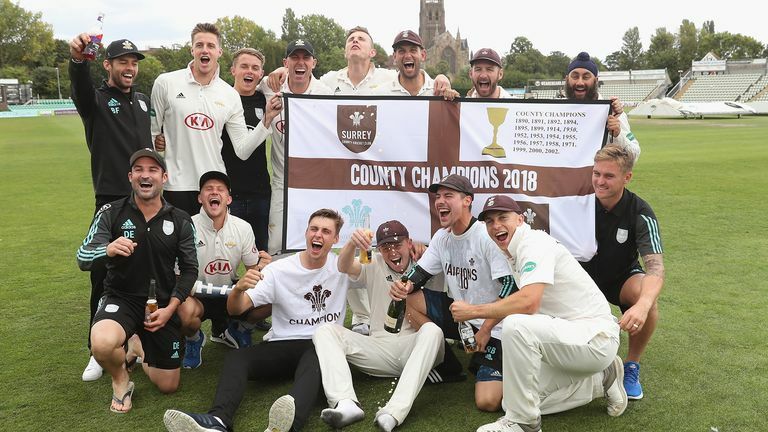 Surrey's director of cricket Alec Stewart says the club's young players have played a key part in their County Championship success. Opener Rory Burns (66) pushed his claims for inclusion on England's winter tours to Sri Lanka and West Indies by improving his season run tally to 1,241 at an average of 68.94. The skipper shared an opening stand of 111 with Mark Stoneman, who contributed 59 before being bowled by Wayne Parnell for 59. Burns' pursuit of a fifth Championship century of the campaign ended when he was bowled by Pennington in the 40th over of Surrey's innings - the score 135-2. Dean Elgar (21) soon followed, castled by Josh Tongue, but England's Ollie Pope and Ben Foakes saw Surrey through to lunch with no further alarms. The pair brought up their 50-run stand when Pope hit Ed Barnard for four and Foakes seemed well set until he top-edged an attempted pull off Wayne Parnell to depart for 22. Worcestershire's hopes of a dramatic win gained momentum when Will Jacks and Pope fell in successive overs, the latter clean bowled by Pennington, but the target was down to single figures by the time the seamer removed Tom Curran. Skipper Burns reflected: "It was in the balance overnight with a tricky score to chase but I'm delighted to get over the line. I watched most of it from the tea room; I was having a coffee, just trying to keep myself quite chilled. But I'm delighted. "It has been a massive team effort from everyone involved; obviously there have been a couple of standouts every now and again and a couple of young England players in the mix, which is always handy. "The ambition has definitely got to be to try and get numbers 10 and 11 [wins] notched up; I'm just happy with number nine and the win."